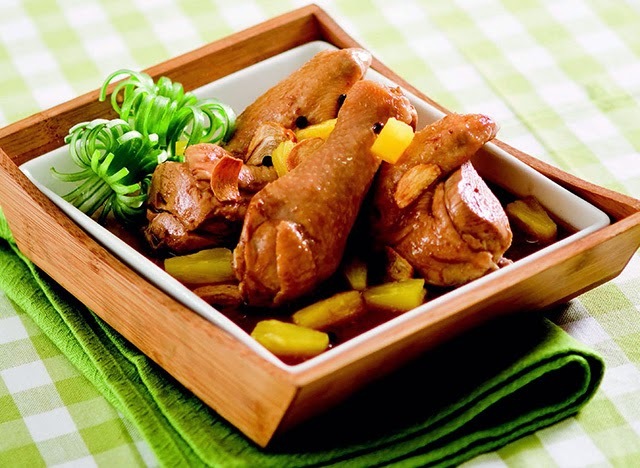 We’ve made your family’s favourite ulam even more kid-friendly and healthy. 1. In a bowl, mix all the ingredients for the marinade. 2. Marinate chicken for 30 minutes. Drain and reserve marinade. 3. Fry chicken in oil until brown. 4. Combine chicken with marinade then simmer until chicken is tender. Season with sugar to taste. 5. Add DEL MONTE Pineapple Tidbits. Allow to simmer. Top with fried garlic.